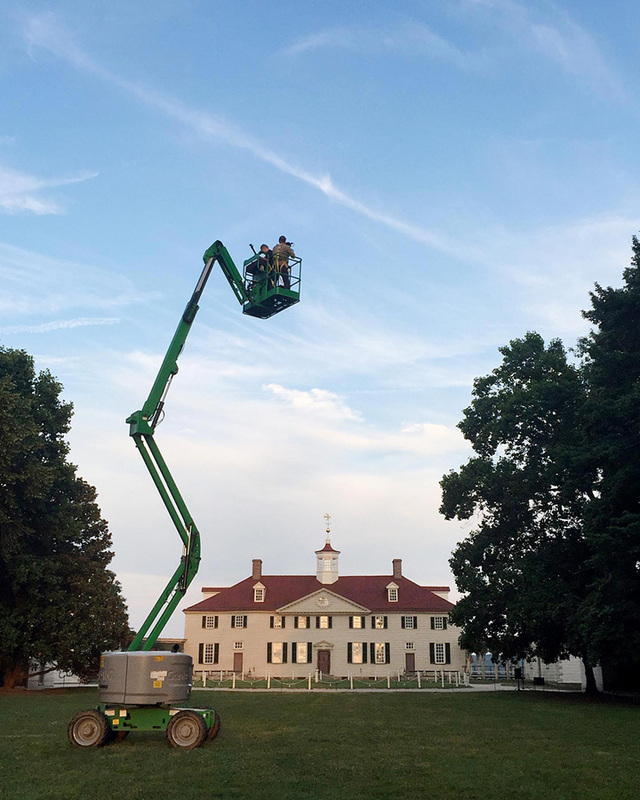 Forty feet in the air and filming at George Washington's Mount Vernon, June, 2016, to create a b-roll library for Virginia Tourism. Stills & Direction, Cameron Davidson. Art Direction, Sarah Hauser, Virginia Tourism Corporation. Photo by Chris Flanegan. I bring thirty years experience as a commercial photographer turned filmmaker and videographer to every project. That's thirty years of seeing, observing, lighting, and capturing still and moving images. It's what I love to do. I specialize in promotional documentaries and in small crew productions which are nimble on their feet but still cinematic in scope. Some clients rely on me to shepherd their projects from inception to completion, others draw on my expertise as a member of the crew, hiring me as a DP or a cameraman. In recent years my videos have aired on the big screens in Yankee Stadium and in the Prudential Center. I have had the honor of filming Justice Ruth Bader Ginsberg in New York and of being the cameraman on a project with Oscar winner, Billy Bob Thornton, in Los Angeles. Virginia Tourism brought me in to create a b-roll library of George Washington's Mount Vernon which is in use in the Virginia is for Lovers campaign. As part of a project for Columbia Business School I directed, DP’d, and interviewed Nobel Laureate Joseph Stiglitz. Princeton University commissioned me to spend twelve days filming the architecture of its campus and Crystal Bridges Museum of American Art selected me to document a Frank Lloyd Wright house just prior to and during its dismantling. Supercuts relied on me to film and photograph profiles of four of its franchisees spread between New Jersey and Oklahoma. APCO Worldwide flew me to the Houston area to create a b-roll library for one of its clients and there are many more… an international certification group which sent me to Washington, D.C., to film interviews with Senators, Congresspeople, clients, and staff; a few camera manufacturers I got to be a cameraman or DP for on projects, and numerous corporate and academic clients who hired me to film interviews and b-roll libraries. 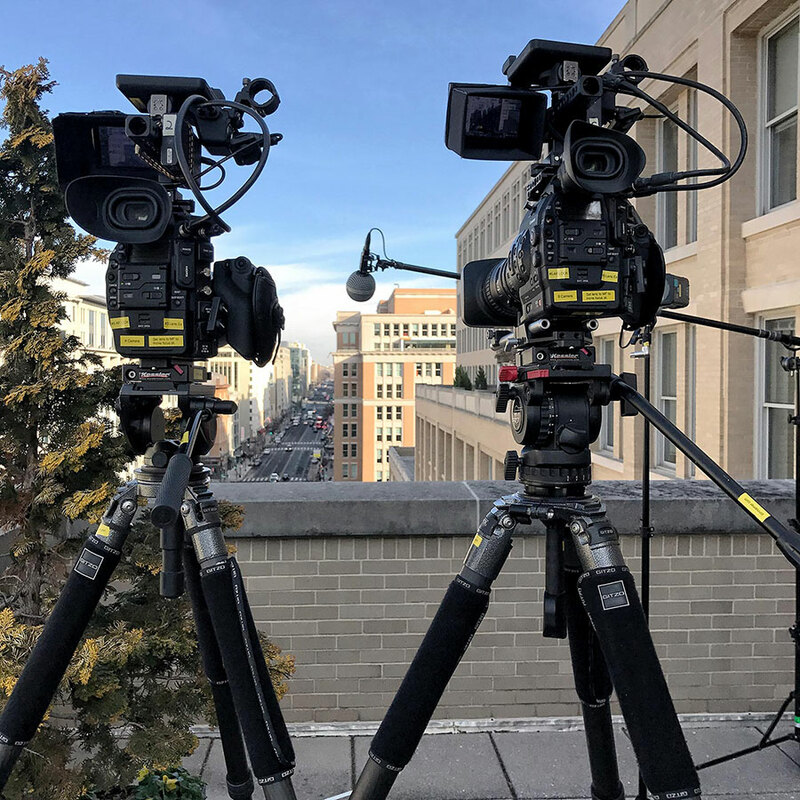 Two-camera interview setup on a Washington, D.C., rooftop. Production services include concept development, storyboarding, script writing, project planning and execution, and post-production including editing and graphics. First and foremost, I am here to tell your story. I listen to what you want to accomplish and the production is scaled to fit the scope of your needs. Video has a reputation for being expensive but it doesn't have to be. Understanding the give and take of crew size, services, and post-production is the key to striking the right balance between the level of the production and the cost of a project. 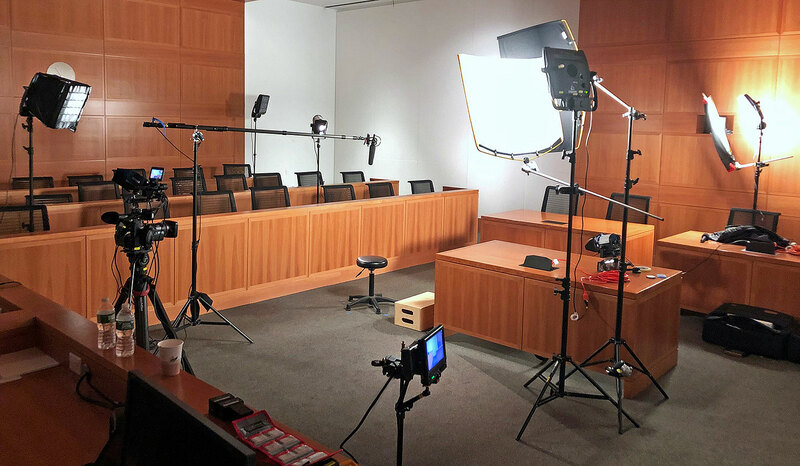 Interview setup on location in a New York City law school's moot courtroom. I shoot a mix of people and place for editorial, corporate, design, academic, architecture, and advertising clients. They rely on me to create signature images which will set the tone for their publications, web sites, and marketing efforts. My portrait preference is to shoot on location, playing off of a subject's environment to help tell their story. My architecture work is noted for its attention to detail in planning, shooting, and post-production. 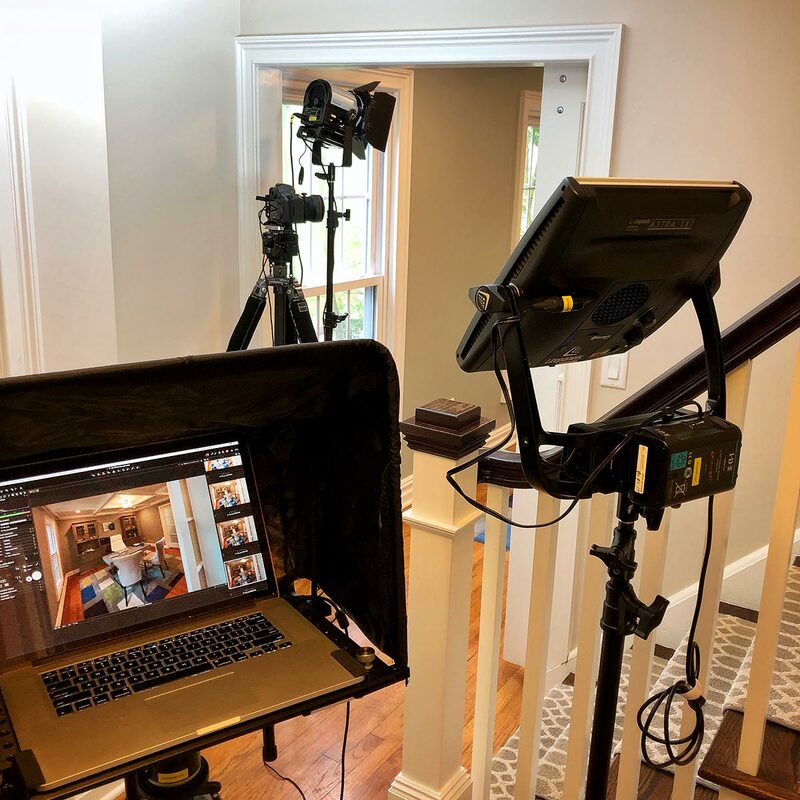 Shooting residential architectural interiors with a 50MP camera, tilt/shift lens, and continuous LED lighting while tethered to a laptop for instant image review. I am equipped to handle most any project with high resolution (50MP) and high-speed/low-light (20MP) cameras, battery and AC powered strobe kits, and specialty lenses for architecture. My work has received multiple CASE Awards, been in the Black Book AR100 Award Show, and been cited by Communication Arts with an Award of Excellence. 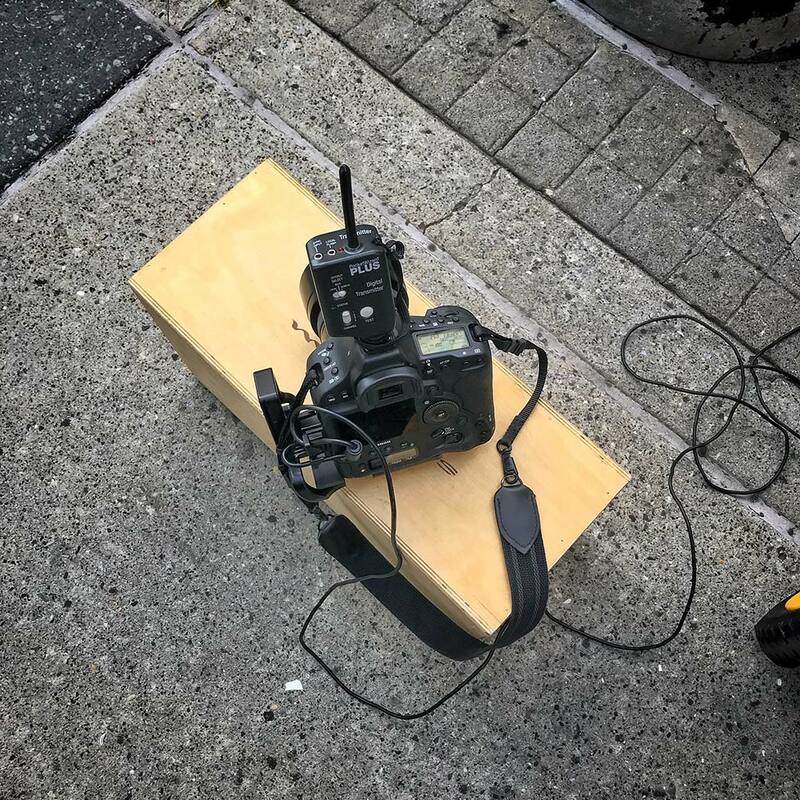 Canon 1DX Mark II at the ready on the streets of Hoboken's waterfront district for a location portrait. Sign up for my mailing list! Learn about my recent projects, website and blog updates, industry information, BTS - Behind the Scenes info, and more.